The city would get room to widen a road in exchange for giving the owner more redevelopment options. WESTBROOK — Westbrook officials and the owners of the former Maine Rubber building have negotiated an agreement that they say could spur the redevelopment of that property and the rest of the west end of Main Street. The Westbrook Planning Board got its first look Tuesday night at a proposed contract zone for 1.5 acres at 942 Main St., the site of a dilapidated, 27,000-square-foot building at the western entrance to the city’s downtown. The building was the home of Maine Rubber Co., which moved in 1990s, and is now rented out as storage space. The contract zone would require the property owners, brothers David and Jim Elowitch, to tear down the building and give the city a strip of land on the side of the property along William Clarke Drive, where it plans to add a westbound lane. In exchange, the city would give the Elowitches the portion of Saco Street that connects William Clarke Drive and Main Street in front of their property. The city would also permit drive-through banks on the property. In 2011, the city secured a $125,000 Community Development Block Grant to pay for most or all of the demolition of the building. Since then, officials and the property owners have been trying to negotiate a deal to make use of that money. Jim Elowitch said Wednesday that it doesn’t make sense for them to tear down the building, where they are making money from rent, unless its redevelopment is promising. The Elowitches have been working to get a bank, restaurant or retailer to commit to the site. Banks would be more interested if drive-throughs were allowed, Elowitch said. 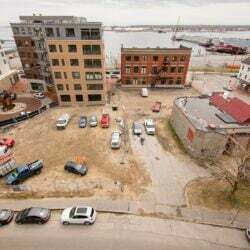 Also, being able to use a portion of Saco Street as a private entrance and exit to the property would make it more attractive to potential tenants, he said. The city hoped to buy the strip of land along William Clarke Drive to complete its overhaul of that route, said City Administrator Jerre Bryant. Getting that land for free would reduce the cost of that project and give it a better chance of receiving state funding, he said. The Planning Board will hold a public hearing on the contract zone Feb. 5. The zone would eventually need the approval of the City Council.